Ein paranormales Drama? Es spielt in den USA? Er wird einen Amerikaner spielen? Hab's heute vormittag auch auf TRA gelesen - wird das in den USA gedreht? Oder hier, spielt aber drüben?? Wie macht BBC America das üblicherweise? Schön für John, daß er endlich diese Anerkennung der Amis kriegt - wir wissen ja, wie das in der Vergangenheit ausgesehen hat. Wann geht's los? Peter Popper hat drüben ganz viele Links gepostet, die sich mit der Serie beschäftigen, aber ich hab das noch nicht gelesen. Bin ja gespannt, was das wird. Paranormal ... kann ja so oder so ausgehen. Aber wenn John von dem Drehbuch begeistert ist, kann's ja nur gut werden!! Laut den diversen Artikeln im Netz, fangen die Dreharbeiten im Februar an und enden im Juni. Gedreht wird wohl in Kanada. 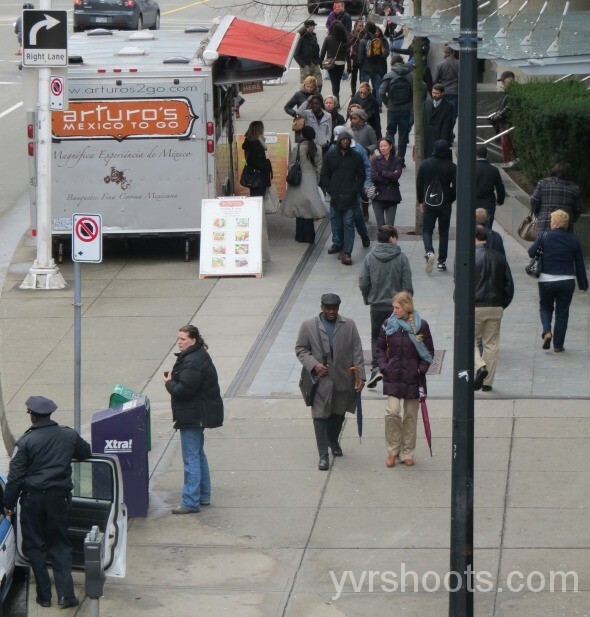 In Vancouver um genauer zu sagen. Ich als (ehemaliger) Akte X Fan bin doppelt begeistert! Ich drücke die Daumen, dass das was ganz Großes wird! Ich würde es ihm echt gönnen! Februar bis Juni ist ganz schön lang ... und die Concorde fliegt ja nicht mehr ... Ob er seine Familie mitnimmt??? Jedenfalls wird's dann sicher bis zum Herbst dauern, bis wir das Ergebnis dann zu sehen kriegen. Oder noch länger ... Aber nichtsdestotrotz - yay! Und ja, er ist ganz schön beschäftigt, unser John ... Bleibt da noch Zeit für die 2. Staffel von The Village? 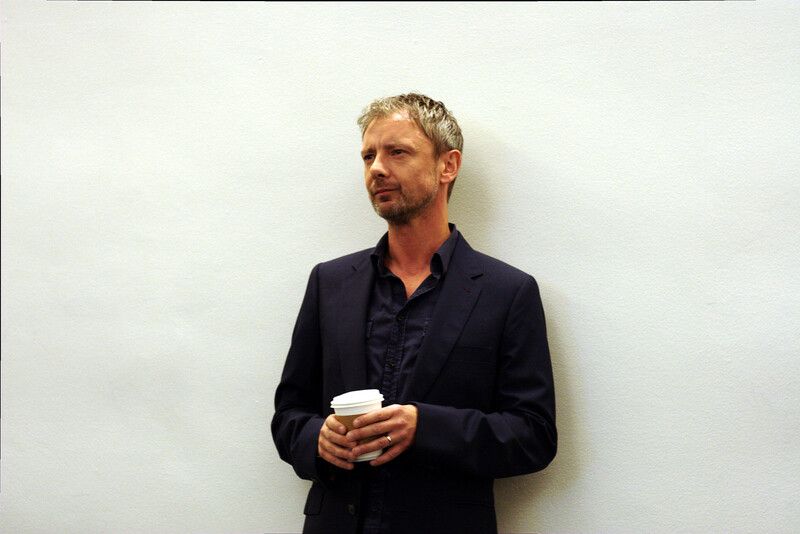 British actor John Simm to shoot ‘The Intruders’ in B.C. 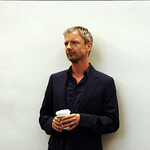 John Simm, pictured in October 2012. 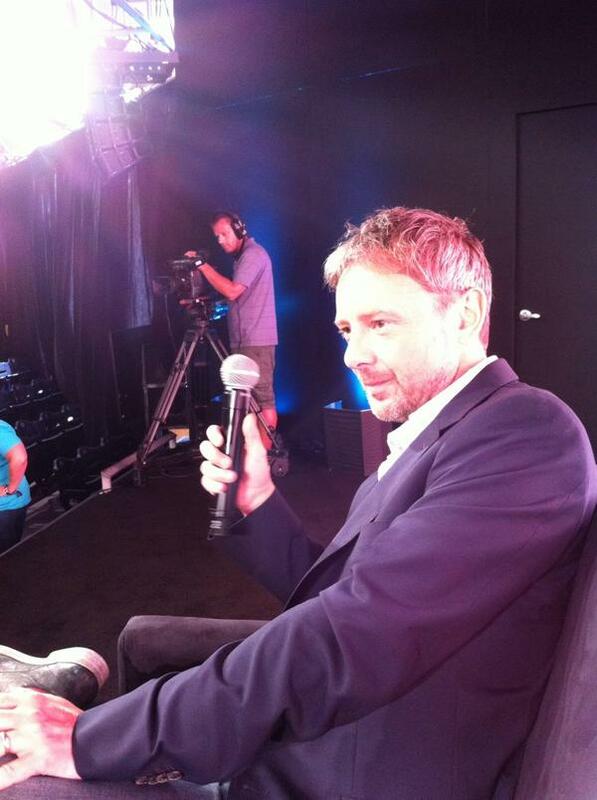 TORONTO — British actor John Simm will be in Vancouver next month to start work on a new series for BBC America. 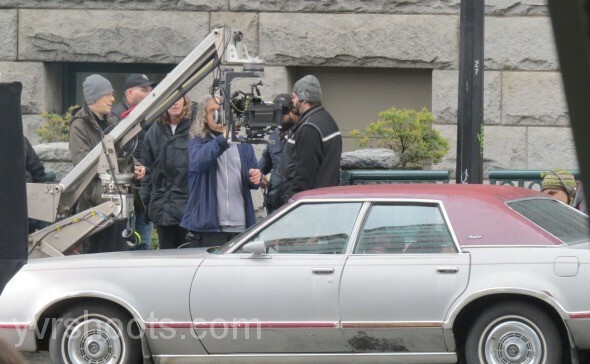 The Intruders — described as “a chilling paranormal drama set in the moody Pacific Northwest” — is scheduled to shoot in B.C. from the end of February until early June. Simm, 43, is well known on the other side of the Atlantic for roles in The Village and Mad Dogs and has twice been nominated for a Best Actor award at the BAFTAs. 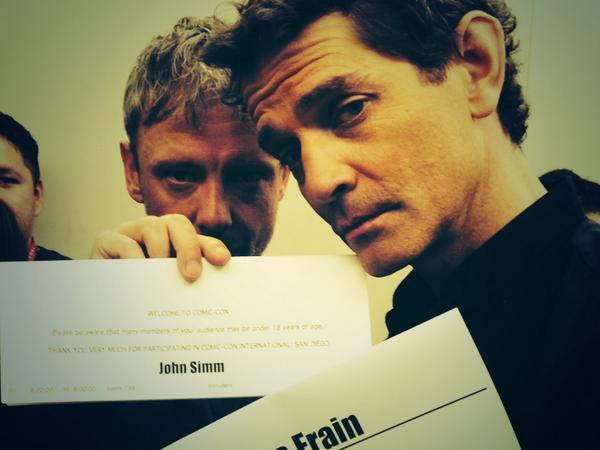 Simm also played The Master in several episodes of Doctor Who opposite David Tennant, who is in B.C. 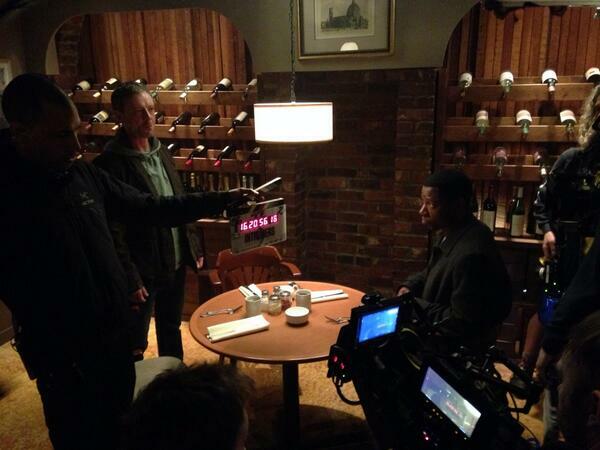 until late May shooting the series Gracepoint [Link]. 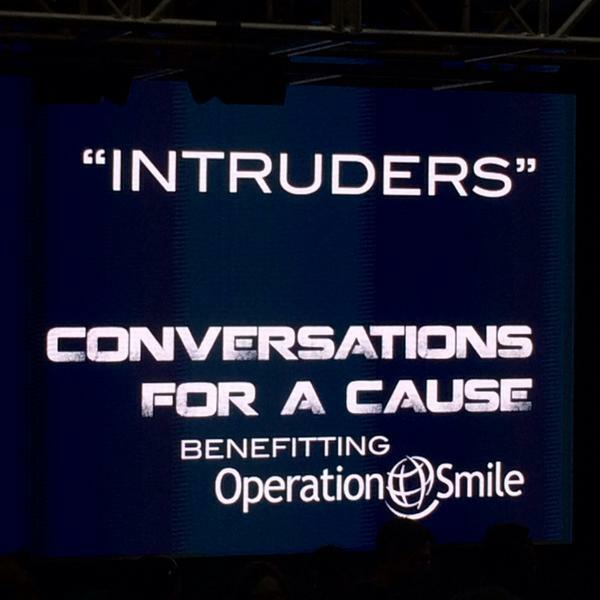 The Intruders is an eight-part series based on the 2007 novel by Michael Marshall. 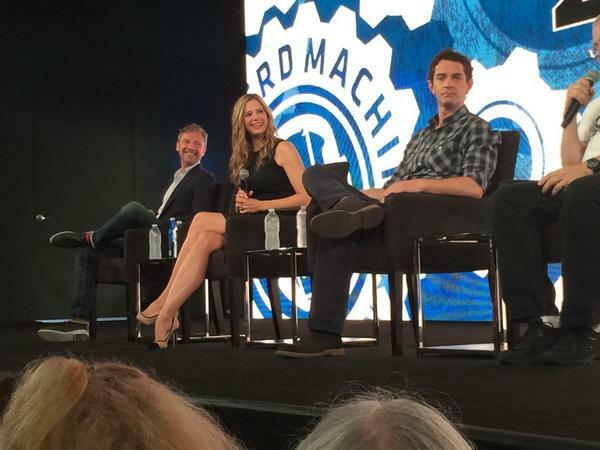 It will be directed by Eduardo Sanchez, co-director of The Blair Witch Project, and Daniel Stamm (The Last Exorcism). The project is not to be confused with a feature film with the same title currently shooting in Sudbury, Ont. Mit Dank an Mira Sorvino, sunnynight und Peter Popper/TRA. 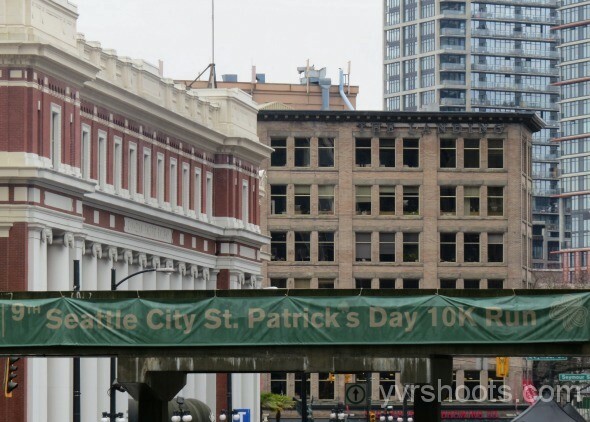 BBC America series The Intruders turned a block west of Vancouver’s Waterfront station into Seattle yesterday, confusing tourists and locals with a big green Seattle City St. Patrick’s Day 10K Run banner on the pedestrian overpass to Granville Plaza. 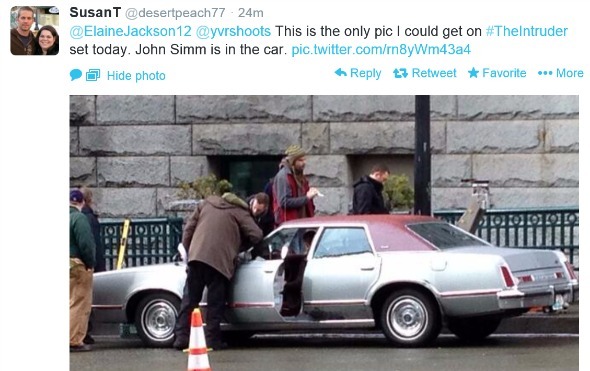 The banner, Seattle area cabs, a Seattle Police Department squad car and paid extras walking on both sides of the street turned out to be background for a scene of lead character Jack Whelan (Brit actor John Simm) sitting in an old beater car from mid-morning to mid-afternoon. The actor has enviable bladder control. The eight-part series is about a secret society whose members aim to live forever by hijacking other people’s bodies, based on the Michael Marshall novel The Intruders. 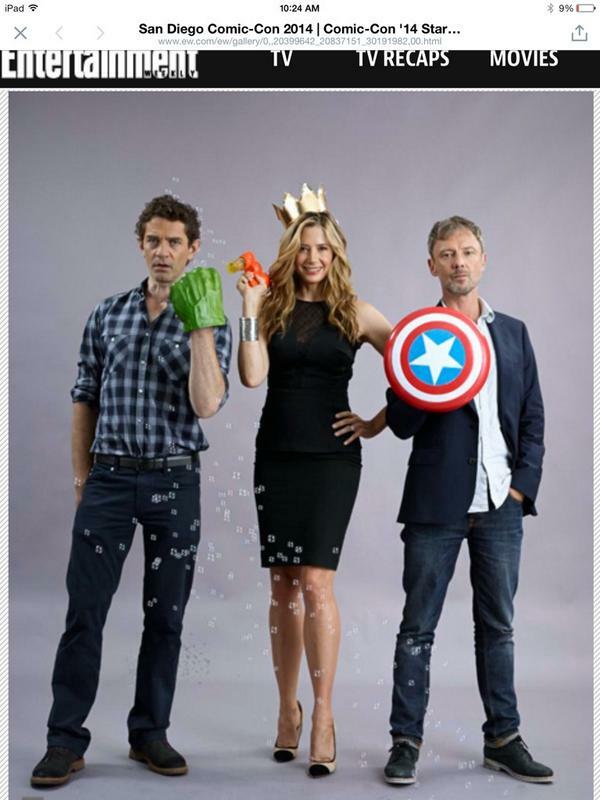 Cop-turned-writer Jack Whelan (John Simm) leaves Los Angeles for the Pacific Northwest in a bid to escape a dark past, but his sins comes back to haunt him when his wife Amy (Mira Sorvino) goes missing. Do the Intruders have her? Yes they do. The Intruders has an interesting cast and creative team: Lead John Simm is best-known for his role as the barking-mad The Master, the nemesis of David Tennant’s Doctor Who. Can we ask for a cameo appearance from The Doctor? 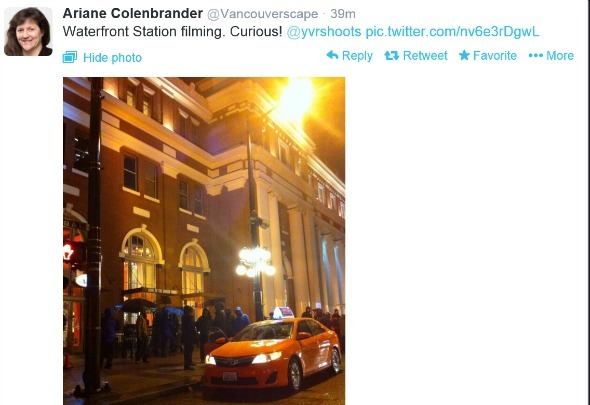 Tennant is currently filming Gracepoint in the greater Victoria area. Simm also played the lead in two other great Brit series: Life on Mars and State of Play. 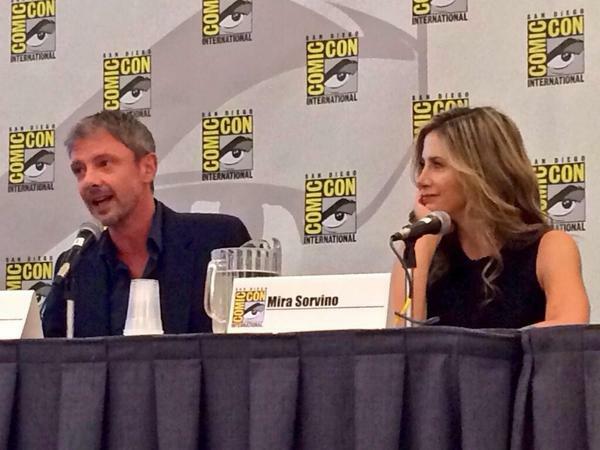 Meanwhile, Oscar winner Mira Sorvino has the fun challenge of playing two characters in one body. 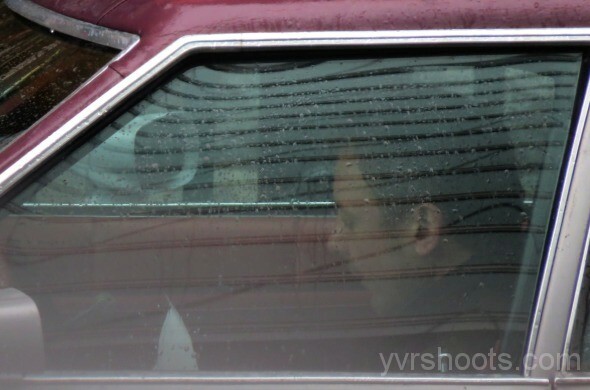 And The Intruders showrunner Glen Morgan is an X-Files alumnus who knows exactly how creepy Vancouver can be on screen. 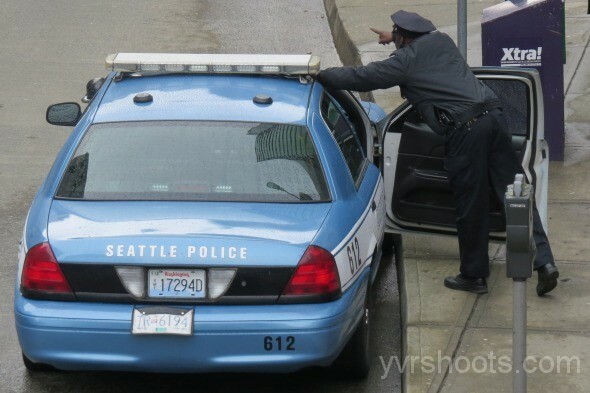 This Seattle police backgrounder performed for the locals and posed for photos between takes. Most of the people walking down Cordova are backgrounders. 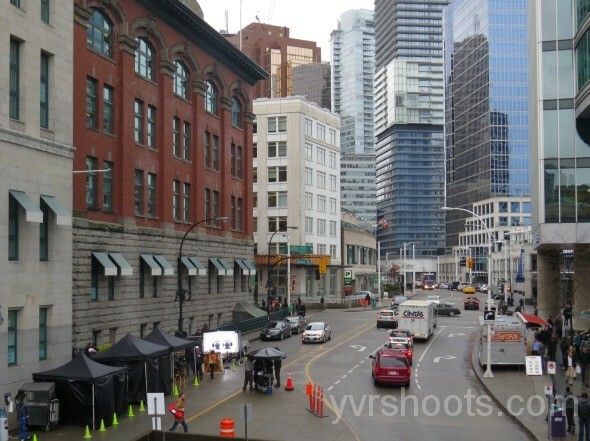 Late afternoon overhead shot from Granville Plaza of the scene below with John Simm double in the car. Confusion about what city we’re in. 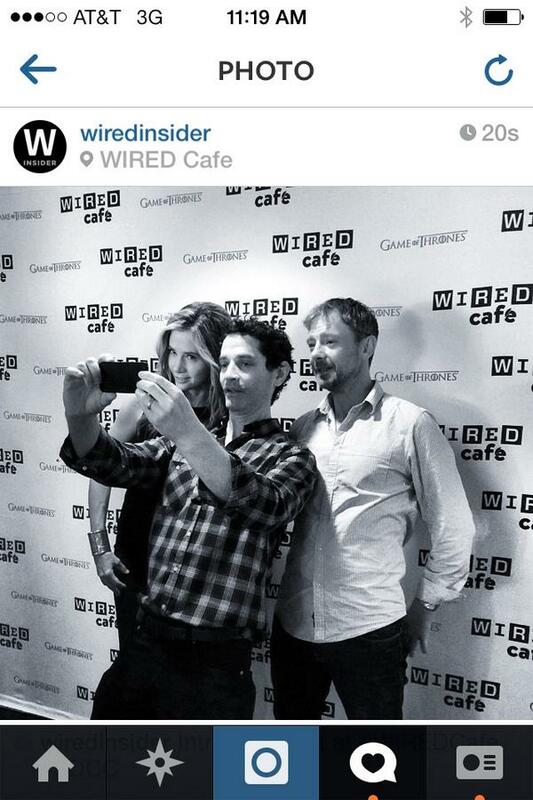 Related: BBC America Series The Intruders Starts Filming February 24th. 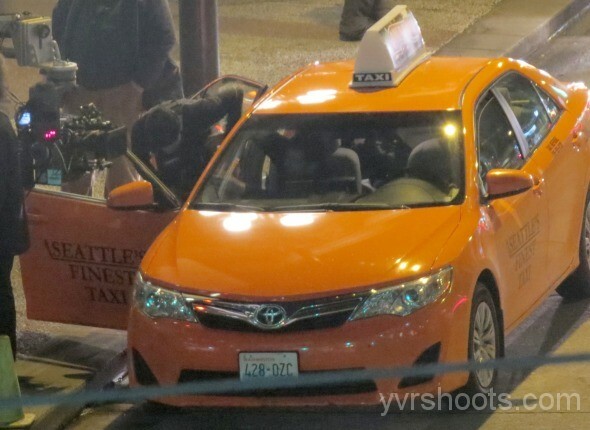 Jack Whelan (John Simm) had another car scene, this time at night in a Seattle cab parked outside Waterfront station. 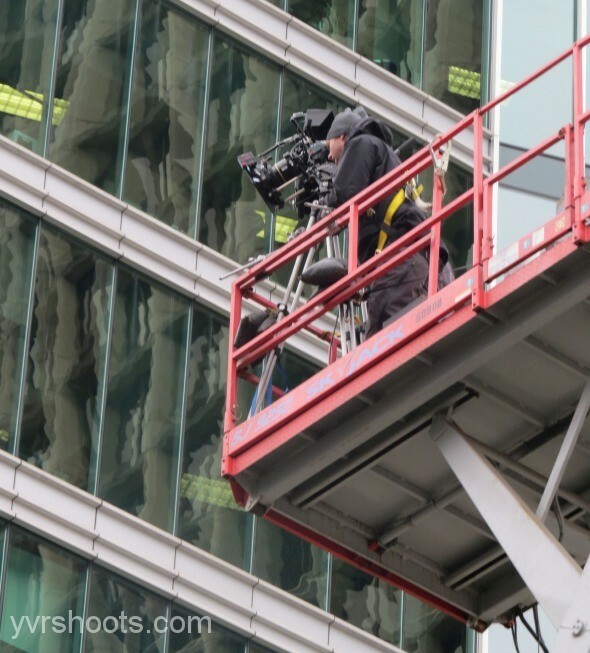 Production then moved up to Granville Plaza to film exterior dialogue scenes. No vehicle in sight. Hatte die Bilder auch gerade bei simmply-simm entedeckt. Mir gefällt Johns bzw. Jacks Outfit! Und es gibt sogar ein Foto mit Brille! Die twitter-Nachrichten sind auch witzig. 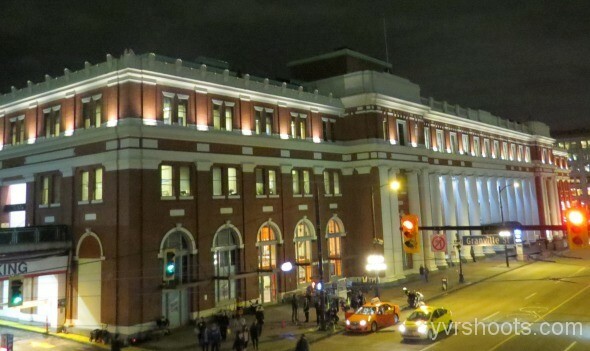 Wird Vancouver mal eben zu Seattle. Wobei in der Gegend bestimmt oft gefilmt wird und die meisten Leute wohl an Filmteams gewöhnt sein dürften. Bin beim Buch inzwischen auf Seite 138 angelangt. Liest es eigentlich sonst noch einer von euch? Mit Dank an @Sanchezonthemic und Bronze Cortina/TRA. 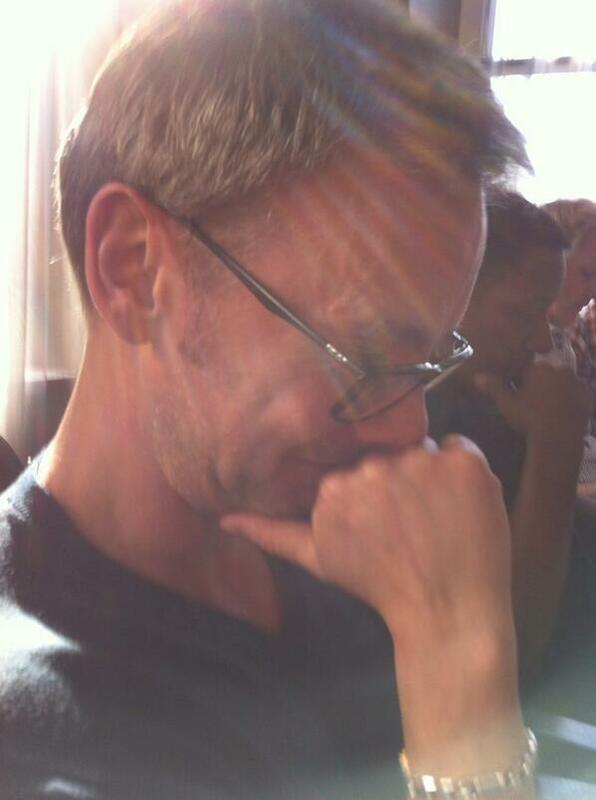 @john_simm are you all done on #Intruders now? @ElaineJackson12 no. I fly back to Vancouver for block 2 next week. the day after i wrap on block 1 of the Village. No rest for the Wicked. 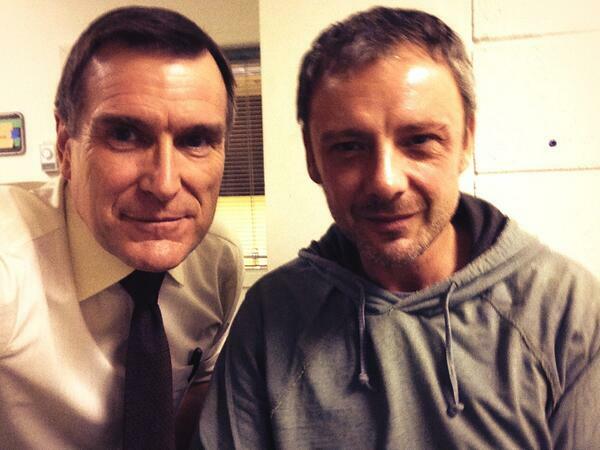 @john_simm So you'll miss #Prey - that's a bit of a bummer! 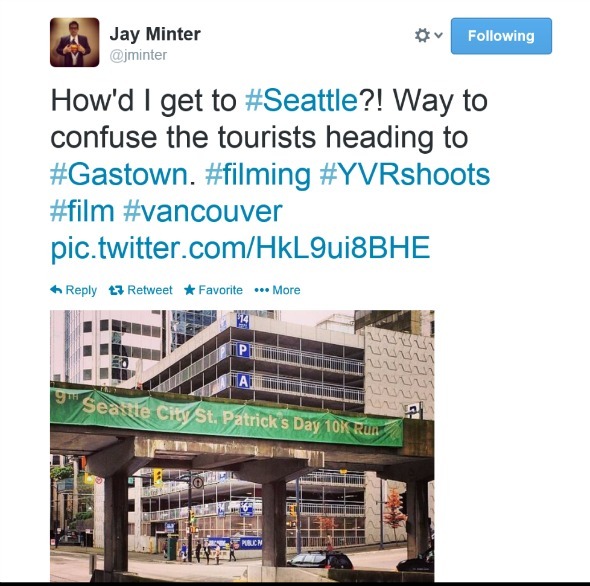 Always know when a trailer has aired - Twitter goes bonkers #JoinTheHunt brill! Wenn die Serie diesen Sommer (August?) schon startet, muss ich mich mit dem Buch mal ranhalten. Habe heute immerhin 10 Seiten weiter gelesen. Gott, ich bin so langsam! Mit Dank an Twitter (John bzw. das Intruders-Team) und Peter Popper für's Posten auf TRA. Die lassen sich echt nicht lumpen, was das Posten von immer neuen Trailern angeht. Alle paar Tage ist ein neuer am Start! Überhaupt dass die Serie gut zehn Wochen nach Drehschluss schon im TV läuft ist beachtlich! Das Buch habe ich ürbigens im Urlaub jetzt endlich mal zu Ende gelesen. Es hat mir sehr gut gefallen! Die Dialoge fand ich teilweise sehr erfrischend und die Figuren interessant. Eine eins zu eins Umsetzung soll es ja nicht sein, deshalb bin ich jetzt sehr auf die Serie gespannt! Ich habe die letzten drei Minuten noch live gesehen und war dann HEILFROH, dass ich zurückspulen konnte, um mir alles anzusehen!!! EDIT: Eine erste Meinung zur ersten Folge von Intruders. Relativ spoiler-frei. 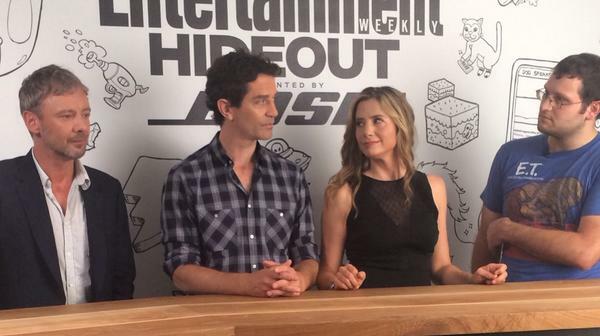 Be sure to follow @Intruders & @OrphanBlack for more #SDCC @BBCAMERICA coverage all day today! 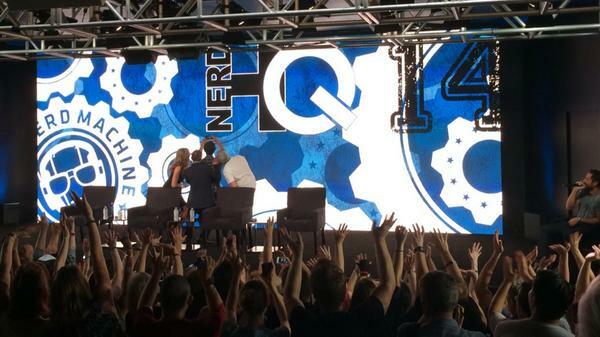 The #INTRUDERS panel is about to get started at #NerdHQ! 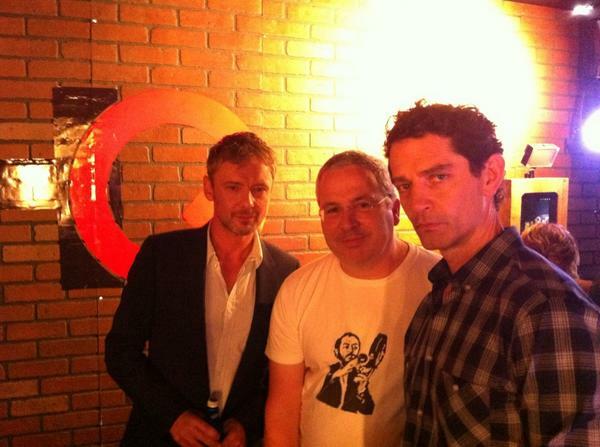 @britjfrain @john_simm @MiraSorvino @GlenMrgn @NerdHQ Looking great as always James! Love the Gary Oldman tale. 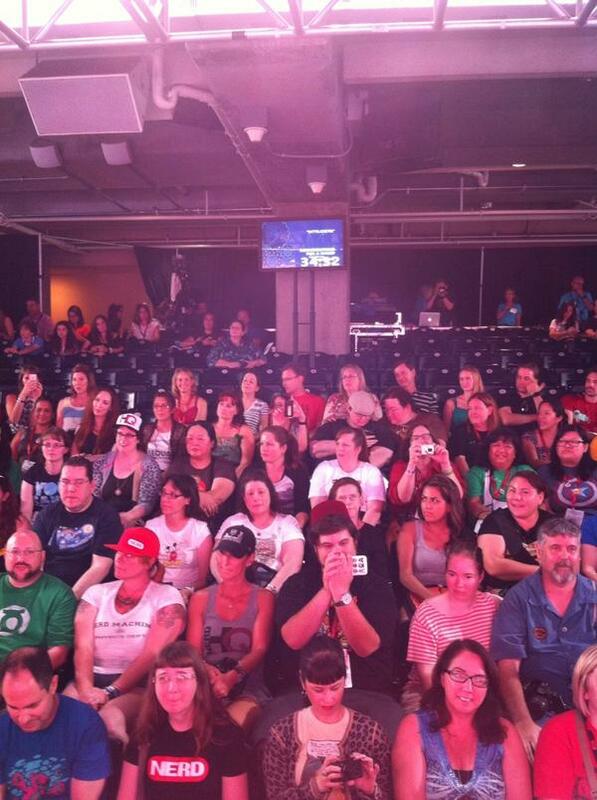 “@tracytcb: @john_simm I spy @theshellmeister in the front row! 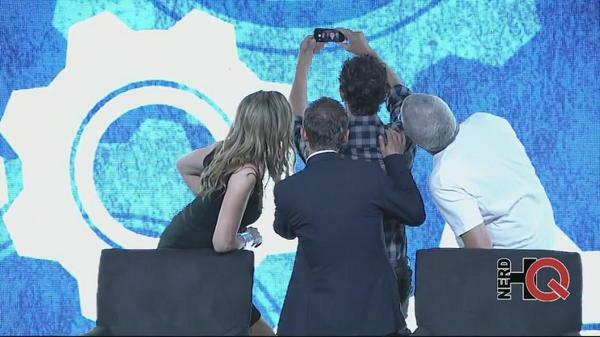 ” He's turning the tables on us taking pics of him! 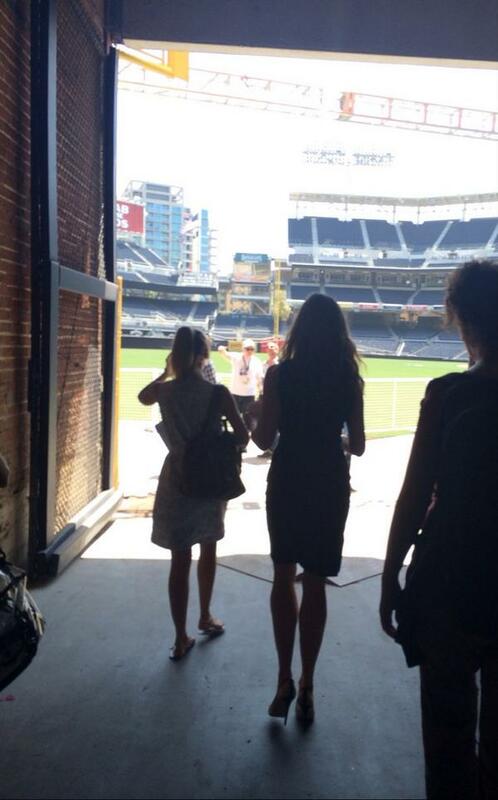 We love you #comiccon2014 fans! 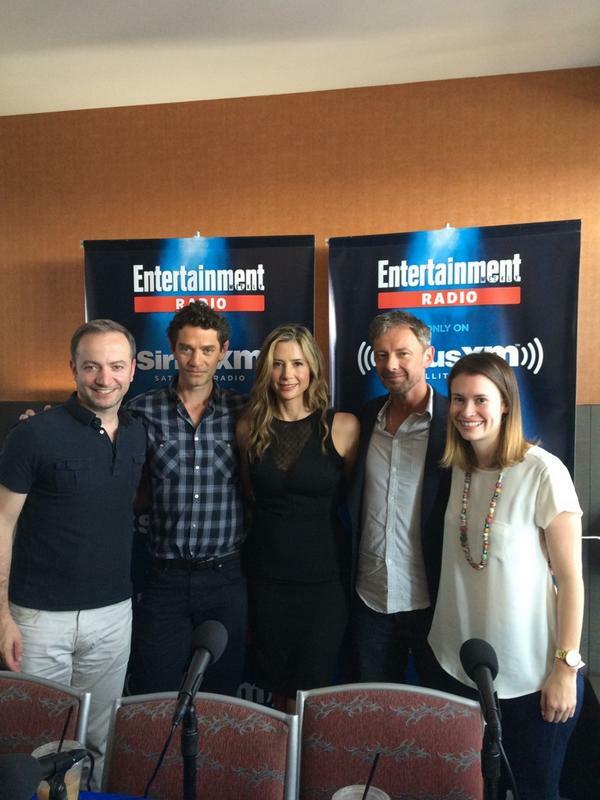 See you next year for season 2 of #INTRUDERS ! Ein weiteres Review zur Pilotfolge. NICHT lesen, wer sich überraschen lassen will! Eins kann ich verraten: Die erste Folge hat die Note A- bekommen.